Over the last week of October and first week of November 2016 a group of UK-based scientists and engineers carried out the first (of hopefully many) mission simulations of the ExoMars rover. The ExoMars rover is the second half of the ESA/Roscosmos ExoMars programme to investigate the surface and atmospheric composition of Mars, looking for signs of life. The first half, the Trace Gas Orbiter, successfully reached Mars in November 2016 and is now preparing to begin its mission. The second half, the rover, is due to be launched in 2020 and will be going to some of the oldest terrains on Mars. There it will drill up to two metres into the surface to look for any evidence of ancient life. Before we send over €1 billion worth of technology all the way to Mars, trials using prototypes of the rover and its instruments are necessary to ensure useful and correct data will be returned, and that the scientists who will be involved in the mission operations know how to interpret these data and use them to guide the rover in its exploration. Numerous UK scientists, including myself and some of my colleagues in the Department of Earth and Planetary Science, are involved in the ExoMars program and were subsequently thrilled to take part in MURFI, a UKSA-funded field simulation of the ExoMars rover mission. MURFI was a collaboration between a number of institutions including RAL Space, UCL, Birkbeck, University of Leicester, University of Oxford, Open University, University of St Andrews, Aberystwyth University, Natural History Museum and Joanneum Research in Austria. With over 60 people involved two core groups were formed. 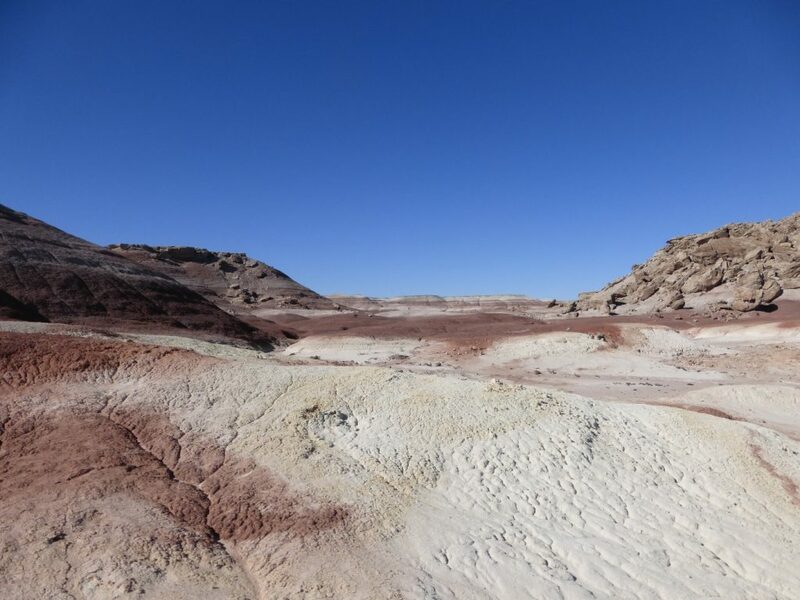 One group set up camp in the Utah desert near to the Mars Desert Research Station and the Canadian Space Agency team (who were conducting their own rover field trials at the same time). 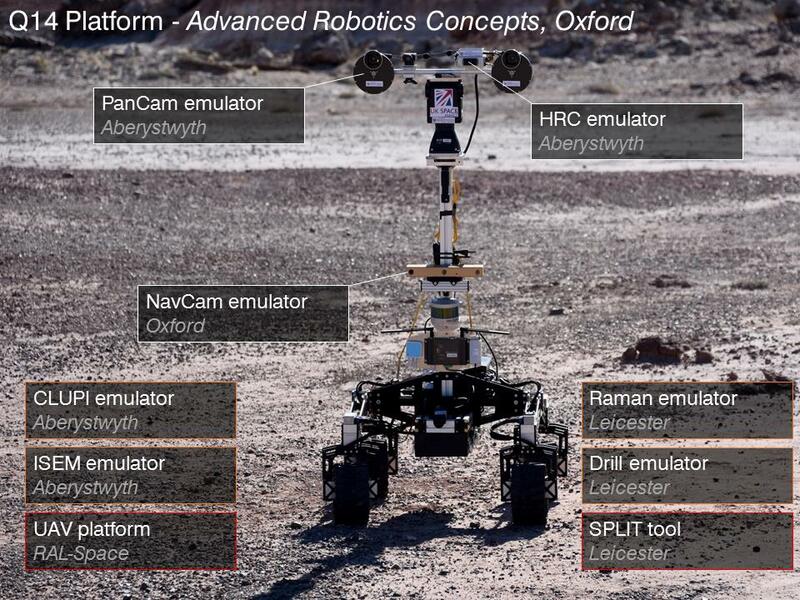 With them were the rover supplied by the robotics group at the University of Oxford and various prototypes of the instruments that are currently being built for the ExoMars rover. It was this field team who would be operating the rover and instruments, collecting the data requested. A second group gathered in the Satellite Catapult Centre in Harwell where a Mission Operations Centre (MOC) was established. This MOC would command the rover, sending detailed daily instructions to the field team. Each day the mission operations team downloaded the data (primarily images) collected by the field team the previous day, analysed these and made a decision as to what we wanted the rover to do next. This was a constant race against the clock as these commands had to be sent to Utah by 2pm UK time, 7am Utah time, to give them a full day to complete our requests. Our primary aim in these decisions each day was to identify a patch of ground to drill into that is (a) drillable with the equipment available and (b) likely to hold evidence of past life. This will also be one of the major goals of the ExoMars rover operations team. Identifying the type of geological environment you are in when all you have are a handful of images to look at is significantly harder than if you are able to walk around the area yourself. However, it is exactly this challenge that we face with robotic exploration and thus learning this skill through field trials such as MURFI is a vital part of mission preparation. The final pieces of data are still being analysed and mission debriefing is still to come but it’s safe to say everyone involved learnt a lot about being part of a rover driving team, and in the case of some, being part of a rover! With approximately five years to go before the ExoMars rover begins its mission this was an important step towards ensuring the UK’s planetary science community are prepared for the heavy work of searching for life on Mars. The BBC came to visit us at Harwell one day to film a section for the Sky at Night which can be found at the end of this episode. More in depth details of the field trial rationale and daily activities can be found at the MURFI blog and via the #MURFI hashtag on twitter. This post was contributed by Dr Peter Grindrod, of Birkbeck’s Department of Earth and Planetary Sciences. Read the first post from this series. It was originally published on his personal blog. It’s been nine months since the last workshop about where the next rover will land on Mars. During that time there have been some fantastic space firsts, including the European Space Agency landing on a comet, and NASA testing a spacecraft that will take humans back into deep space. But we’ve always kept one eye on Mars. Over the summer the proposed eight landing sites for the ExoMars rover were officially reduced to four. We were really pleased that our two sites got through, but we’ve now got a lot of work ahead of us. Last week we were in Italy to discuss the detailed geology of the final four landing sites. With ExoMars trying to find life on Mars, we have to decide which one place offers the best chance of finding it. Such a tough call meant it was a fascinating meeting, as each site offers its own advantages and challenges. The final four sites are Mawrth Valles, Oxia Planum, Hypanis Valles and Aram Dorsum. Despite all four being in the same region of the planet, they show a diversity that you’d expect from an overall area the size of Western Europe. Mawrth Vallis, named after the Welsh name for Mars, is a candidate as strong as its namesake’s rugby team. Mawrth made it through to the final four choices for the Curiosity rover, due to its thick sequence of clay minerals – a sure sign of past water that’s also probably neutral in pH (and presumably good for life). Oxia Planum is about 400km from Mawrth, and shows similar thick, clay layers, but with the added bonus of a channel that may have emptied into a shallow lake. This means we can be even surer of water, which we think is a prerequisite for life. The landing site at Hypanis Valles is actually at the end of the channel of the same name, and most likely represents ancient delta deposits. Here we think sediments, and hopefully life, were laid down in a low energy environment. This site is good because it might concentrate the evidence for life, thus increasing our chances of finding it. And finally Aram Dorsum, which was such an unknown before the last meeting it actually had a different name. At the time there was no feature nearby that we could use to name our landing site. So in the end we had to officially apply to name the site. Despite my attempts to name it after the River Irwell, whose tiny tributary flowed through my village when I was growing up, it was deemed to be a positive relief feature and thus needed a different name. So Aram Dorsum it is. That positive relief at Aram is something that isn’t immediately familiar, although there are quite a few similar features on Earth. It’s basically an inverted river system, where water carves a channel, deposits sediments that then become cemented, while everything outside is eroded away by billions of years of erosion. After this you’re left with a river system, albeit with positive relief. So again, water was flowing through this region, probably about 3.8 to 4 billion years ago, a time when life was probably just getting started on Earth, and possibly Mars. Now it’s a matter of figuring out the complicated history of what has followed at all sites since the water disappeared, and what it means for the possible evidence of life. Can rocks rich in fossilised microbes survive the bombardment from meteorites? Do these meteorite impacts actually make it easier to get at the deeper rocks, which could have been warmer and wetter? So part of what we did last week was to assess the complex histories at each site, discuss the likely habitability of the environments we think were around when the features formed, and ultimately what it all means for life. The other part was to listen to the safety assessments carried out so far on the sites. All the four sites met the global engineering constraints, but local factors such as small, but steep slopes, or the presence of too many sand dunes, increase the risk when it comes to landing on Mars. So although the science might be great, we’ve got to hope that there are no engineering show-stoppers at this stage. As the Philae lander showed, landing on another planetary body is difficult. So I’m happy to keep figuring out the science of where we’ll go, while the engineers work out how to get there in one piece. This post was contributed by Dr Peter Grindrod, of Birkbeck’s Department of Earth and Planetary Sciences. A longer version was originally published on his personal blog. If you had to pick just one place to find life on Mars, where would you go? For the last twenty years, exploring Mars has been a case of “follow the water”. The thinking goes that without water there won’t be life. That could well be true, but it’s only part of the story. 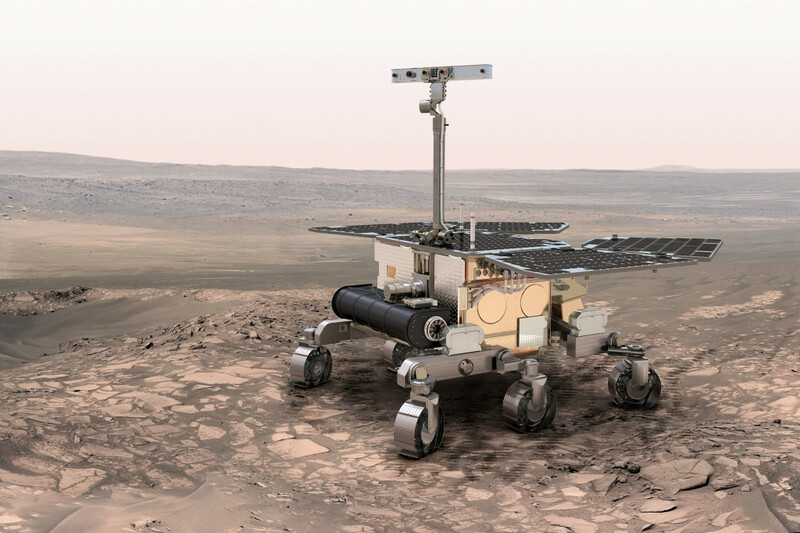 An artist’s impression of the European Space Agency ExoMars rover. Credit: ESA. In the 1970s John Guest, my former PhD supervisor, worked on the NASA Viking mission to Mars. Twin orbiters, twin landers, nobody builds missions like that these days. As a geologist, John helped to decide where one of the landers would touch down. John told me how he and his friend Ron Greeley only had a couple of days’ worth of images from the orbiters, at a frighteningly low-resolution by today’s standards. They had to choose a landing site that wouldn’t leave the landers in pieces and would still be scientifically interesting. I thought that the pressure and responsibility of that decision must have been massive. John seemed nonplussed by my concern. The first image returned from the Viking 2 lander on the surface of Mars. Credit: NASA. I remembered this story because the European Space Agency has recently asked the same question again, and people are trying once more to answer it. But this is no longer the Mars that Ron and John knew with Viking. Back then Mars was a world of giant volcanoes and enormous rift canyons – planet-scale processes. Today we talk about fluvial sediments and river deltas, redox reactions and energy gradients, clay minerals and organic compounds. We talk about it like we do the Earth. And we no longer have to rely on just a handful of low-resolution images and a rushed decision. Instead we have hundreds of terabytes of data at our fingertips to call upon in the search. Technological advances have changed the way we see and explore Mars. The latest images from the HiRISE camera can see things on the surface, from orbit, that are only 25 cm across. It can make out individual rocks. In fact, if you look at modern images of the Viking landing sites, it’s pretty obvious that we would never land somewhere like that again. My god the boulders! It’d be considered far too unsafe nowadays, but I guess that’s testament to the engineering of the Viking landers. How the decision will be made this time is very different too. It’s a reassuringly long and detailed process these days, carried out in the open by many different scientists. After the initial call for landing sites back in December, the first discussion workshop will be held in Madrid later this week. Here Mars scientists will come together to champion their own site, debate the pros and cons of others, and generally make sure that no one place is missed. A few months later a shortlist of three or four sites will be drawn up. Over the following few years, each of these sites will be studied in possibly more detail than any other place on Mars. And then, the year before launch, the European Space Agency will make the final decision. And I can’t say I envy them. It will come down to a delicate yet familiar balance between engineering constraints and scientific goals. As it happens, because of the way that we tend to land on Mars, most of the planet is immediately ruled out. All landers use a parachute to slow themselves down as they come through the thin atmosphere. To make sure that the parachute has enough time to do its job, the landers need to touch down at as low an elevation as possible – the more atmosphere it travels through the longer it has to slow down. So, there go all the interesting high areas. Next, because it’s solar-powered (I presume – there might be communication considerations too), the ExoMars rover has to land in a latitude band straddling the equator that’s only 30 degrees from top to bottom. That’s the polar caps out then. 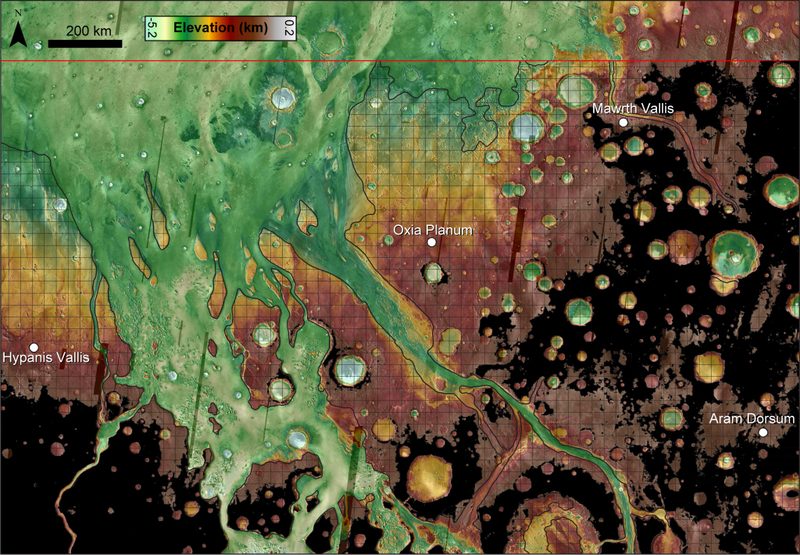 A blink animation of a global map of the topography of Mars, showing the elevation and latitude constraints when selecting a landing site for ExoMars. Credit: Peter Grindrod. Finally, landing on another planet isn’t a pinpoint process. There’s a certain probability of landing within a given distance of the target. This uncertainty is known as the landing ellipse, and for ExoMars it’s the equivalent of trying to land in Manchester, but knowing you might end up in Liverpool or Sheffield. Can you imagine the horror? The ellipse for ExoMars is also over four times the size of the ellipse for the recent Curiosity landing, so forget any ideas you had of going to the sites rejected for that mission. So that doesn’t leave all that much. And we haven’t even started yet on the actual scientific goals of this mission, essentially why we’re going there. The goals of ExoMars are pretty clear, and pretty bold. The first though has the most control on choosing where to land: to search for signs of past and present life on Mars. Most of the evidence that we’ve gathered since Viking says that the earlier parts of Mars’s history were the most hospitable to life. It was certainly wetter, probably warmer, and with a much thicker atmosphere than today. So ExoMars has to land somewhere with ancient rocks that are a record of that environment. That means landing somewhere older than 3.6 billion years old. That’s about the same age as some of the oldest rocks on Earth. And bearing in mind what we know about life on Earth, there has to be evidence of water too, both in the shape of the landscape and in the minerals in the rocks. ExoMars is going to drill two metres into the sub-surface, as exposure to the radiation at the surface might have broken down any evidence of life. So the rocks to drill, core and study are soft, sedimentary rocks that can be read like a history book. Finally, there have to be as many of these targets as possible close to the centre of the ellipse, and as little dust cover as possible. Over the last few months I’ve been part of a group of UK-based scientists who have been trying to help answer the question of where to land. We knew that other people would propose most of the other well-known sites. So we’re not exactly rooting for the underdog, rather making sure that nowhere is missed. From our own list of about thirty sites, we narrowed it down to just two that met all of the criteria, and which we’ve now sent off for consideration with everybody else’s suggestions. Later this week we’ll be in Madrid discussing all these sites. I’m looking forward to it, and have to admit that it’s exciting and humbling to have even a small part in the process. But it’ll be sad for me too. Both John, who was a mentor and friend, and Ron died recently, less than a year apart. They’ll both be missed. It’s strange to think that they’ll both be missing the latest stage of our exploration of Mars that they helped to pioneer. I’m sure we’ll raise a glass to them. And I hope that wherever ExoMars does land, it’ll be an adventure worthy of future story-telling.